Please look at my many other items that have also been reduced ! SALE! 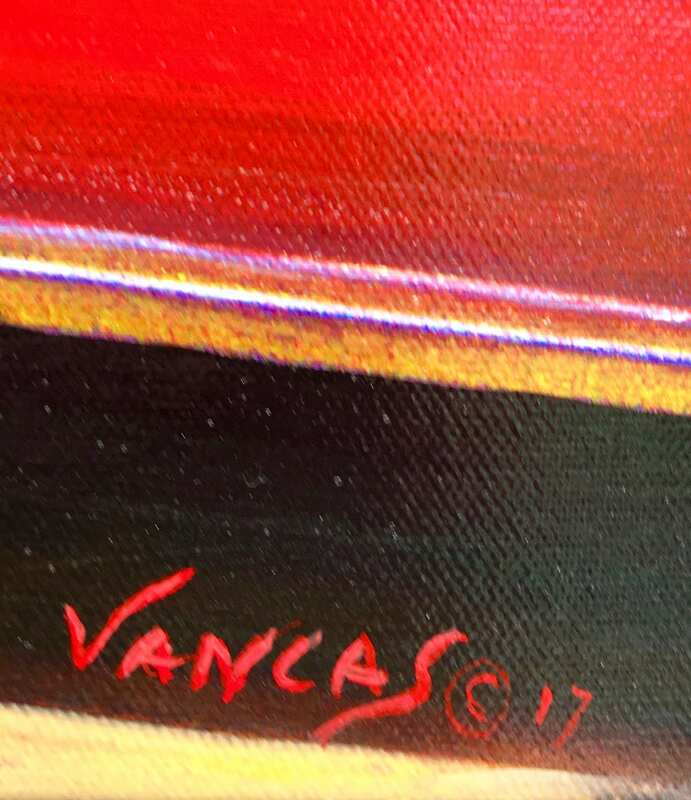 ORIGINAL PAINTING by Vancas! 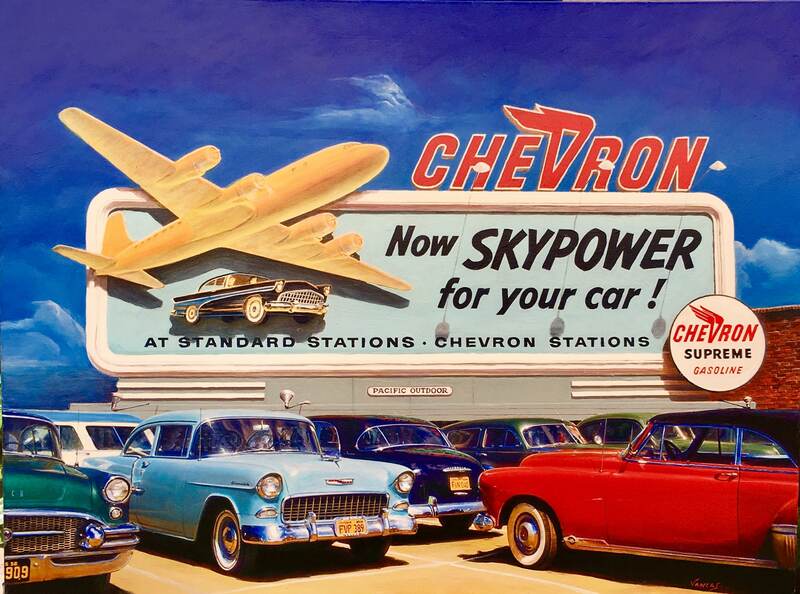 It is apx 40X30 on Canvas - Los Angeles Airport Parking with great cars and fantastic aviation and automobile themed billboard of 1956. New Offering! First time offered! . You you can request a smaller variation of same quality, apx 20x28 for much less. Ships fully insured in tube for best protection. ALL ART, IMAGES AND PHOTOS ARE THE COPYRIGHT OF THE ARTIST DANIEL VANCAS, 1993-2017, ALL RIGHTS RES. A Great gift for those into midcentury art, illustration, pinup Detective, Police, Art Deco, Pulp Fiction, Illustration art, Golden Age of Hollywood, films and Movies. Diner, burger joints, Ice Cream, Coca-Cola, Coke, Hot Rods, retro wear, vintage clothing, W.W.II and Korean War bird, nose art and aviation collectors; and of course those that love their Martini, swing, RAT PACK, Sinatra, Elvis, Marilyn and Rock A Billy set. Would look great by the dresser, pool table, bedroom, bathroom, game room, and with 1930's art deco furniture, original paintings and sculpture. Daniel Vancas is the creator of the "Vancas Girls" pinup and has also has painted more than 238 replicas of Elvgren pin-ups. 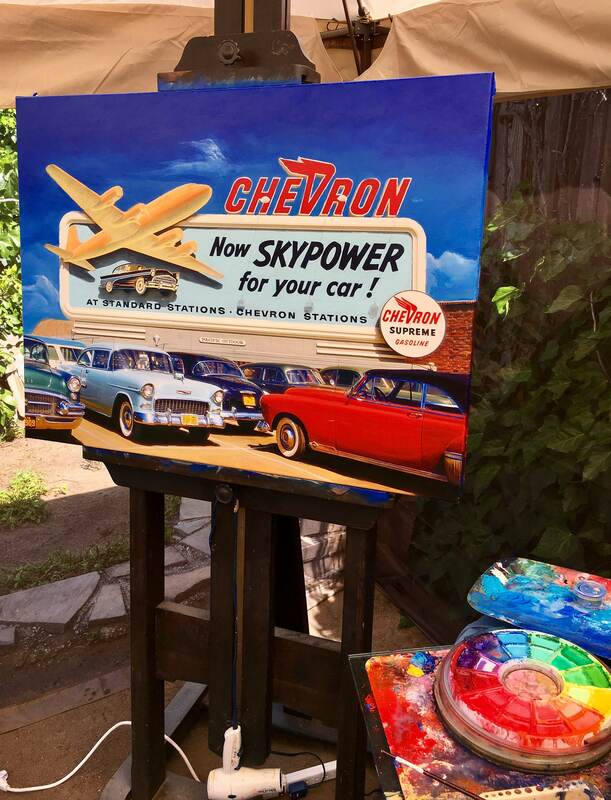 He also paints illustration, vintage nostalgic images of midcentury America. They have confirm SOLD values of $3500 to over $6,500. Rarely ever seen outside of the gallery. As a proud owner of the Elvgren trademarks, Daniel Vancas has use these marks continual since 1994, 1st issue 1997 and re-issued, final, over 23year use since 1994, Confirmed May 2001 and Nov.15, 2005. Daniel Vancas is listed as a registered Vero I.P. Property Rights Owner with ELVGREN art brand since 2001. His Elvgren TM has been approved and accepted as the separate ownership of Daniel Vancas, as agreed with B&B in permanent and final agreements which were made order and recorded in Federal Court March 2001. Per this order licensee's or their 3rd parties of B&B, such as art dealers, authors, book publishers may NOT disrupt, slander Mr. Vancas art business and/or I.P. (Which includes this auction, slander on his name and products, his lawful trademarks and derivative artist copyrights on apx 130 Elvgren images, paintings, prints etc.) This being said this mark was reconfirmed and re-issued by the Federal Trademark and Patent Office, after they LOST (due to unknown internal loss or theft) Daniel Vancas' 5 year filing and use statement along with a major portion of his original TM files. There was not cancelation of registration for any other reason. Because of his documented confirmations, use and supporting court order his ownership rights remain unchanged at the Federal Court because it is a Permanent irrevocable Order of the Court.